My PrePandaPrep is going ok. Mabango has picked up a couple of levels. Mabaho has finished Vash and the Highlands and I’ve been running FL dailies for a week or so to get back into there. Dasal has levelled about 2/3 of her tailoring, but I have to farm some last bits of Runecloth before I can jump into Netherweave. Mab also picked up an random epic off a mob which suited Dasal well. She’s got about 5 purples now. The one area that isn’t going well is Dasal healing heroics. I’m really struggling for healing power when Holy and to try and get my head around the rotations (such as they are) in Disc. At this stage I’m planning to run a bunch of normals again, and earn JP that way until my gear is better. That way I can run Holy instead of trying to figure out Disc. I guess part of it has to be the skill/gear of the others running too. If the tank is only just making the cut (and lets be honest, the over geared people are all in DS 5mans now) then that amplifies my problems. 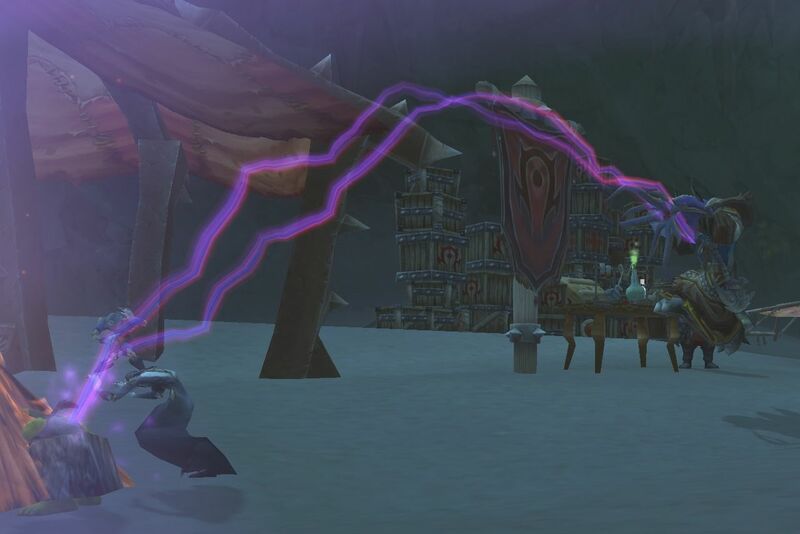 I’ve said it before, but here’s more evidence of it, I really struggle when trying to switch a toon between specs rather than playing a different toon. It’s like Mab running Ele spec or worse, Resto (shudder). Maybe my brain is too old and inflexible? 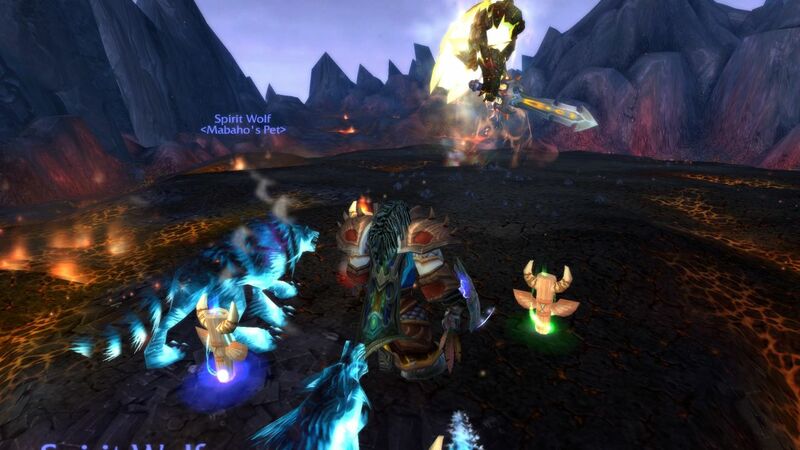 Author MabahoPosted on April 29, 2012 May 31, 2012 Categories WoWTags alts, heroics, PrePandaPrep, WoW3 Comments on Heroic Struggles. I put the VFR in for its service today to the usual shop. I had also booked the loaner, a old, but smooth running CB250, that is a bit of fun. 124,000km – a minor service as I got out of sync a bit by doing my last major about 3000 early. “How are you with larger bikes” – the VFR is pretty much the biggest bike I’ve ridden, with only the Streetfighter 848 any bigger in capacity and nothing heavier. I was a bit concerned as I expected him to rock up with a Boulevard or something. “Uh.. ok… I guess”, trying to figure out what he meant – higher capacity just means being sensible with the right wrist. A cruiser or something means a whole different style. He led me out to the lot, “Because I was going to let you take this” He pointed to a 2002 Suzuki Hayabusa. So without further ado (well ok there was still the copy of the licence, sign away my life on the paperwork etc) I was away. Work is about 5 mins from the shop, so by the time I was rolling in the gate it had likely barely warmed up. I came back out at lunch and set off for a short ride. I rode down the freeway for several kilometres playing with the gears and roll on accelerations. Pretty nice pickup and a great sound from the Yoshi pipe that seems almost derigeur for most Suzuki sports bikes. I turned off and headed back into the local shopping precinct, to see what its like through traffic. On the less busy back streets I found it pretty docile, but ready to roar with a small twist. But a nice linear pull away. After several blocks of first gear slow riding it started to warm up. Whilst the temps didn’t climb much my legs were starting to get very warm as the fans blew the air from the radiators over them. Uncomfortably warm actually and I was glad to roll up the on ramp (passing a bunch of cars as I did, grin) and get the airflow. Back to work. Overall, I did think it was a nice bike. A lot more power than my VFR, very rideable though and easy to control. I don’t think I’ll rush out and buy one though. Still nice to say I have ridden one and happy to ride one again. Just didn’t step of it with the silly grin that I did with the -600. Might have to look into pipes for the VFR though. Oh, the service … found out my licence plate globe holder has burnt itself out. I’ve been suspicious of this for some time as the last 2 registration renewals have commented the globe was out and I was testing to see if it was bulb life or something worse. Bit strange, perhaps related to either the wiring recall work or the alternator failure. The part is on order. 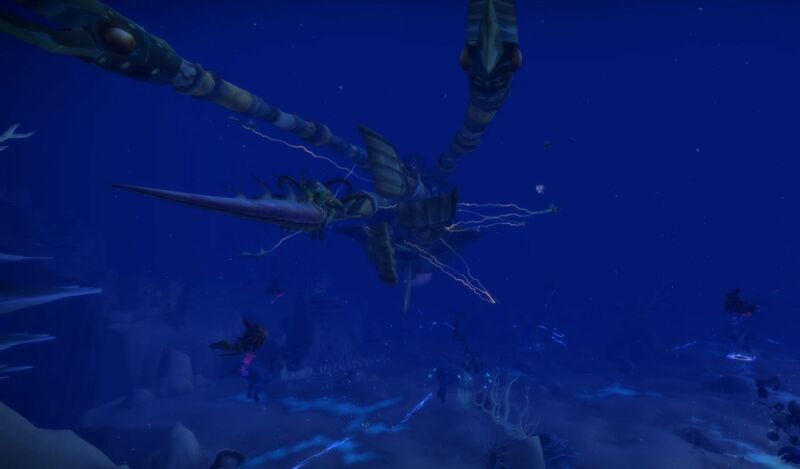 Anyway, with the success of TH, I turned to what in my opinion whilst being one of the most unique zones in WoW, is simultaneously the most annoying as I hate trying to move about in Vash’jir. Even with the mount and the buff, it’s just annoying. I had no quests left in my log so I planned to search some of the quest hubs to try and figure out where I had got up to. I zoned in and arrived at Tenebrous Cavern. And standing in front of me are three good fellows with ! over their heads. Yay. I had about 15 quests to finish the zone achieve and an unknown number to finish the quest story after that. So I was convinced to put one of the Merciless Ones heads on…. didn’t go well. 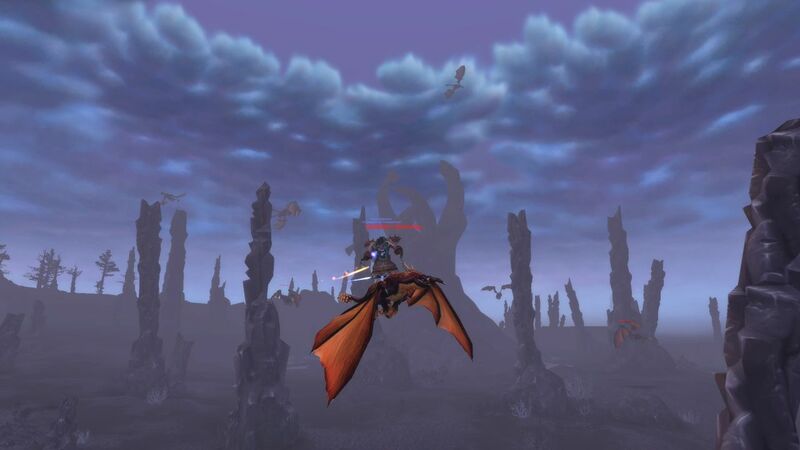 Neptulon rises up to face the Naga. So eventually I finished the whole lot up. The story ends with a leap into the Abyss. With my new list decided, I hit the road. First up I sorted out the bank alts. Mabango had been the herb holder, but that wouldn’t work if she was to eventually level up. So another was sorted out with a collection of bags and a lot of mail later, the herbs were moved. Similarly each of the others were checked through, tided and organised. Next on the list I decided to tackle tailoring on Dasal. I emptied the cloth bank alt and spent 90mins sewing and d/e. Eventually Mabango scored a few pieces before I ran out of runecloth just before the switch to netherweave. So Dasal will have to get out there farm some. Prepare to be Holy Nova’d! I also stumbled across the fact that Worgen are actually able to change to human after a chance encounter in Winterspring (where Mabango was questing). Went back and got this stylish individual…. oh dear. 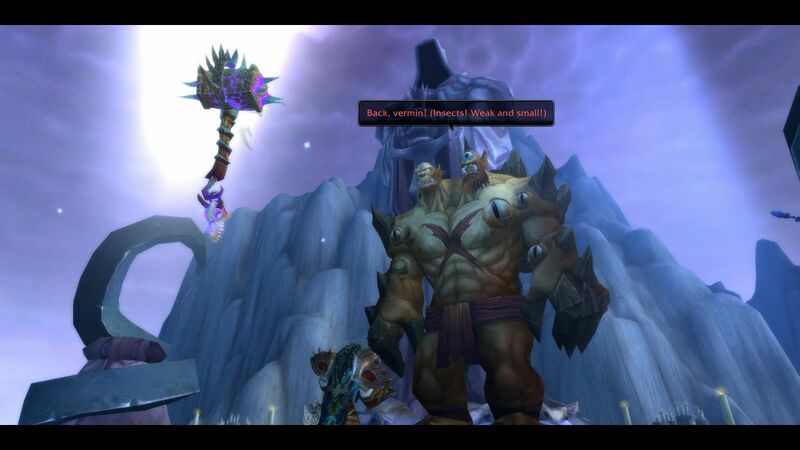 I did try sending Dasal into another Heroic but it fell apart shortly after starting. So I switched over to Mabaho. Mabaho was almost finished Twilight Highlands and still had some quests in his log. Got busy with helping the horde at Crushblow. Fire the Cannon – Lord Cannon is next up. Hey watch out, it’s the Temple of Doom…. The fight is on. Skullcrusher the Mountain is going down. King of the Mountain achieve too. Twilight Highlands done and dusted. 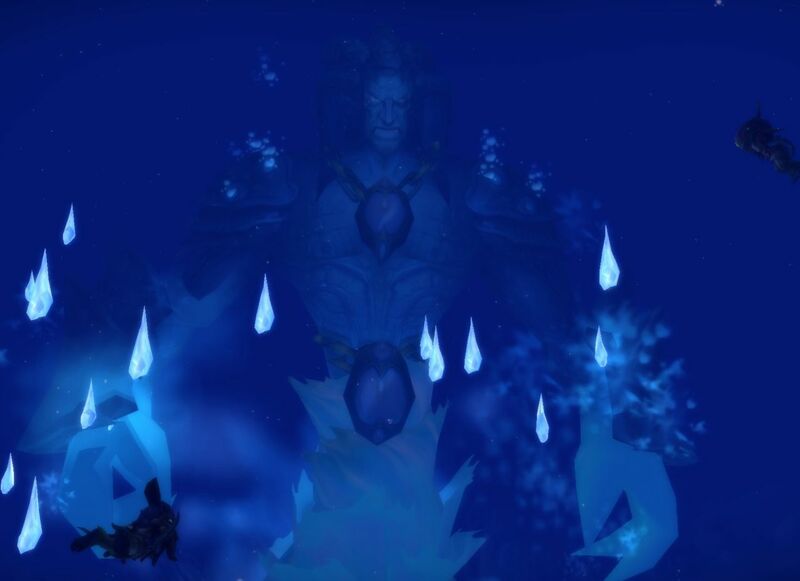 Only Vash’jir to go. Going to have to scour the zone to find out where my last quest giver was. So the PrePandaPrep is well under way. 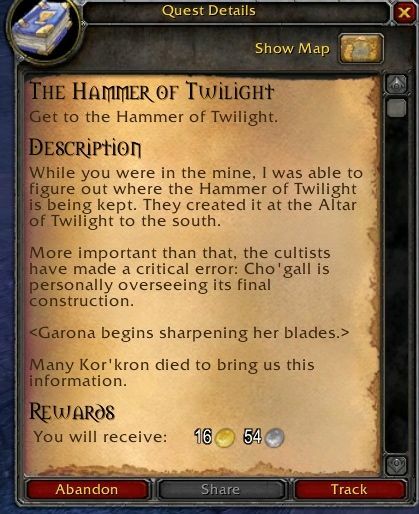 Garona channels General umm.. somebody from RotJ (read the final sentence) The lady who opens the briefing. Hmm links nicely with the trap shortly after reading this too. Pandas – The To Do List. Inspired by the Harpy who was in turn inspired by this thorough list from Godmother I too have decided to set some goals for Pre Panda Prep. save the gold for Epic flying skill. Sounds simple and she’s more than halfway there. 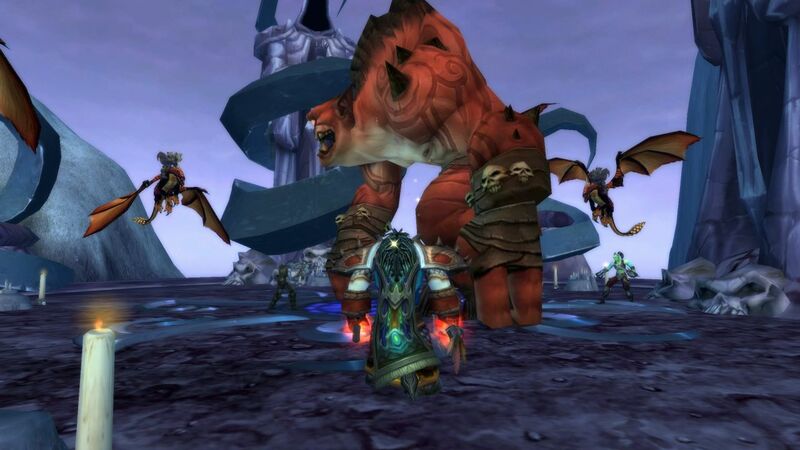 But there’s a big slow patch in Outlands coming up. Mabaho took about 2 years to get to 70, 6 months to hit 80, and about 4 months to get to 85, when he was basically the only one that I was actively playing, Dasal and Mabango have come along since then. Absolutely it is faster now with guild and heirloom bonuses along with better designed quests. Of my other alts, they are pretty much going to stay as is. I have to decide what to do with Mandrougas, my lonely Alliance hunter. I expect a DELETE is coming soon so I can get in and save a good name for a Panda. This will give me a free slot with the additional one from the expac so if I ever decide to I can create a Paladin, the only class I don’t currently have. I still have a bit of a “Horde don’t need no stinking Paladins” opinion, but they have been doing good work as tanks and heals ever since their introduction. Goals should be achievable and be able to be done in small steps – check. I even have a good mix of stuff I can do when I have lots of time (Dasal and Mab in Heroics) or just ten minutes here and there (quests, professions). 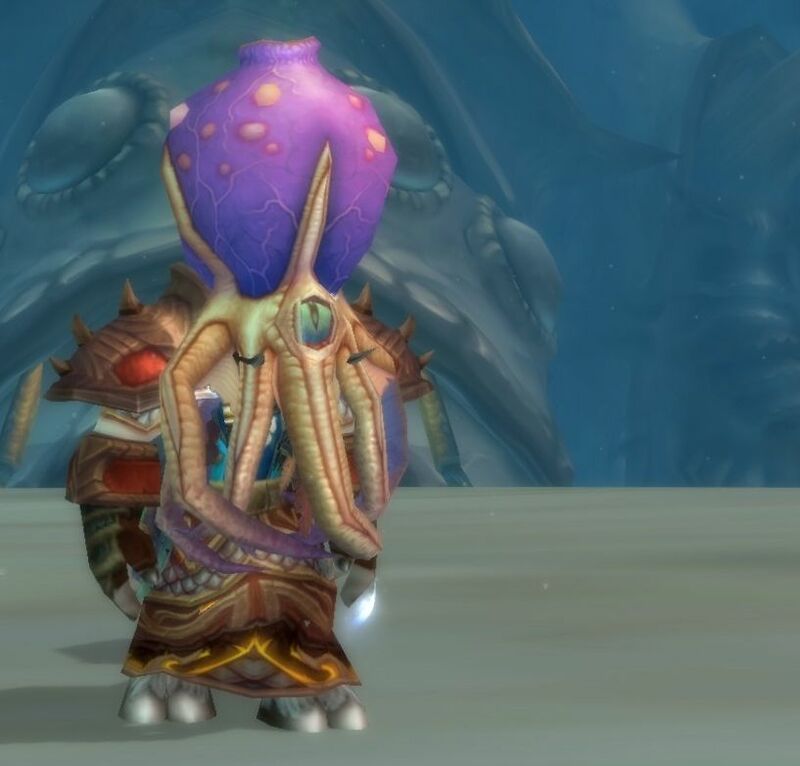 If I guess MoP would be out sometime late this year (November/December) I think there is time. Hmm, the beta is on at the moment, so maybe earlier?? 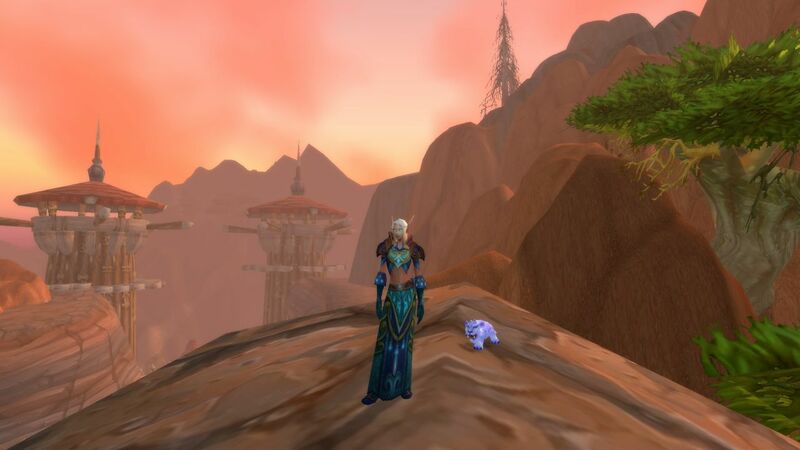 Author MabahoPosted on April 20, 2012 May 31, 2012 Categories WoWTags alts, MoP, PrePandaPrep, WoW1 Comment on Pandas – The To Do List. Haven’t been home, so not a lot of chance to play. Got on this morning and did some levelling of Mabango. Mabango has moved back to Org after her hard work with the egg collecting. 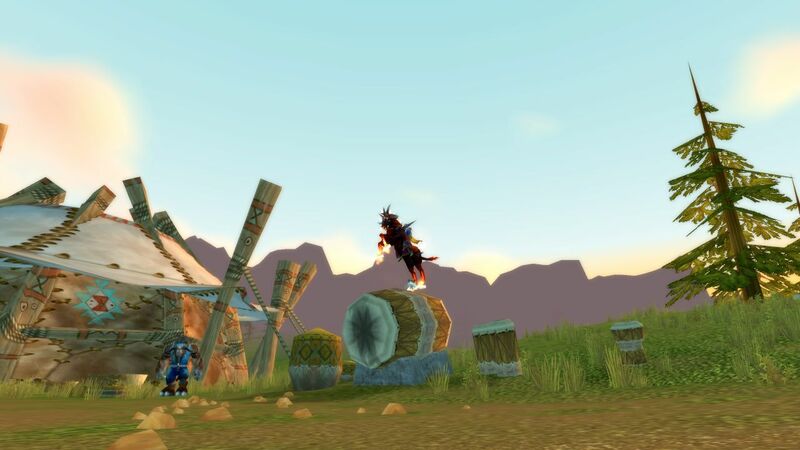 A check through the log and it was back to Winterspring to get back into questing. As I expected to be on for an hour or so, I queued for a dungeon. And it came up pretty quick, considering it was 5am. It was not a surprise. LFG tool at various levels is limited in its options for dungeons. In the 30s you’ll do nearly endless runs of Mara, and later endless runs through BRD. First run was a shortcut past the Guzzler and it went smoothly. Smoothly in that as I was DPS they weren’t depending upon my minuscule output. If I’d been heals or tank things would have taken a lot longer. Success and the achieve, and the majority of the group requeued. For BRD again lol. We were back up to the Guzzler again (the slow way this time) when I had to stop in order to get dressed for work. One thing about BRD that is really annoying, being a dwarf enclave, everything is metal or leather, not a lot of cloth drops (none in both runs in fact). Mabango got two levels out of it which was nice. And of course some coin. Author MabahoPosted on April 20, 2012 Categories WoWTags alts, WoWLeave a comment on A slow week. Once again, work had sent me to Canberra and once again it works out a lot more convenient for me to get myself there… and that means a ride. And once again, the weather was doing its crazy thing. Summer here was complete washout, but Autumn had been pretty nice. Warm, not hot, not much rain… perfect. But of course the weather changed as the ride drew closer. I left on Tuesday. On Monday they were warning us about flash flooding and downpours for the next few days. If it rained, whilst I could still ride, it wouldn’t be as much fun and I may be tempted to slab it. I was already planning to slab it home anyway due to time constraints again. If the weather meant slabbing both ways it would be a real disappointment. As I had all day and generally it takes me about 5-6 hours to get to Canberra the scenic route, I planned to leave about 9am. However 6am the dark clouds were getting ominous and the weather radar was starting to show lots of pretty colours. I hit the road. The rain was costal initially, the opposite way to Canberra. A dash from the city limits was decided, and then from there I would take it as it comes. My routes to Canberra do generally give me an option to change to slab about every hour or so. Down the M7, then the M5, which becomes the Hume Highway (31) and rolls all the way to Melbourne. I arrived a the Picton turn off, still having avoided the rain and decided that it was time for some fun. I followed the road up into Picton, then a pleasant 30 mins or so along the road, headed towards Mittagong. This eventually lead me back to the Hume. Now my previous few runs down here, I’ve turned off at Mittagong and wound my way through the small towns, before reaching Moss Vale and eventually turning up towards the good bit along the Highland Way. Over the years these towns have grown so that they almost merge together and the ride becomes a stretch of slow speeds, traffic and towns. Not a lot of fun. So something I planned last time, but missed the turn. This time, from the other direction it was a lot easier. I slabbed along until the turn for Sutton Forest. This got me back on the back roads, but skipped Mittagong – Moss Vale. I’d been on the road for something over an hour and hadn’t even had breakfast so I stopped to take a break and eat the sandwiches I’d packed. As I stood around munching away, the rain slowly started. I geared up and headed off. A few shaky moments as I settled into the wet roads, and my wet gear again. I’m sure the car caught up behind me was shaking their head. In Bundanoon I stopped for fuel and the shop owner described the wet weather chaos I had left behind, third hand from callers to the radio station. Sounded like I got out of there just in time as the rain was only light here. On the move the rain swiftly dissipated until and for the remainder of the ride I had a mix of overcast or broken clouds but no more rain. The wet weather gear stayed on for a long while just in case. I cruised along what was fast becoming one of my favourite rides, the Highland Way. Nearly no traffic, mostly 100 limits, good condition road, though not always a full two lanes of seal. An hour or so later I arrived back at the Hume. Another quick bite and took off. This time for something new. I had been browsing Google Maps a few days back and hit on a new route, which I asked some other trusty explorers I know about the condition. It came as a recommended option. Turning at Jerrara Road, towards Bungonia (don’t you love Aussie place names!) then on through Windellama (or Windy Llama!) before turning west again towards Tarago, Bungendore and eventually Canberra. That was the plan. And I almost stuffed it. Whilst on the short stretch of Hume towards Jerrara Rd I came across road works where they were building a new overpass/on ramp. The signs read “South Marulen Rd” but as I passed the new overpass the old road appeared just past it. I spotted a sign down the road JERRARA RD. Crap, the turn off. Luckily we’re still in the construction zone so I braked and veered into the cones. in the relative safety of the cones I did the most insane thing, turning around and heading the wrong way up the freeway. Inside the cones or not, any copper gong past would certainly come over to have a quiet word. About 5 metres later I turned up the road. This road wasn’t as quite the same build standard as the Highland Way, but it was in good shape and flowed nicely at 100 (or a little more) So another hour or passed smoothly as I wound my way south and then west. Eventually I passed through Bungendore and into Queenbeyan and finally Canberra. My meeting was scheduled for the morning, and it turner out that the drizzle and rain finally caught up to me so Canberra awoke to some light rain. I wasn’t too disappointed as the return trip was always going to be Hume Hwy the whole way. Gearing up I was on the road with about 90mins of extra time up my sleeve. The rain though got steadily more constant and steadily heavier, until I’d been riding in rain for about 3 of my 3hrs and 30 min trip. My visor completely lost the plot when I hit the city freeway traffic, no idea why, but it made for a very nervous rider as cars appeared out of the gloom. Sadly my rain gear didn’t quite live up to its own previous standard and I was very wet in some areas. Though I’m not sure any rain gear would have held up, I was wet, but not cold so it was alright. But slabbing is absolutely no fun at all!!! About Monday I think, after a last run through Grim Batol (normal) I had enough JP get another piece of gear from the vendors. 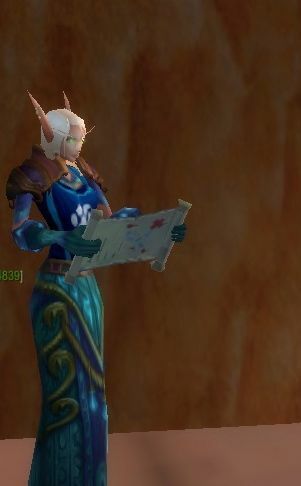 This got Dasal just over the iLevel so she can finally start Heroic 5mans in Cata. I lined up for a run, knowing that it would be tough having only just barely made the cut. I didn’t realise quite how hard. 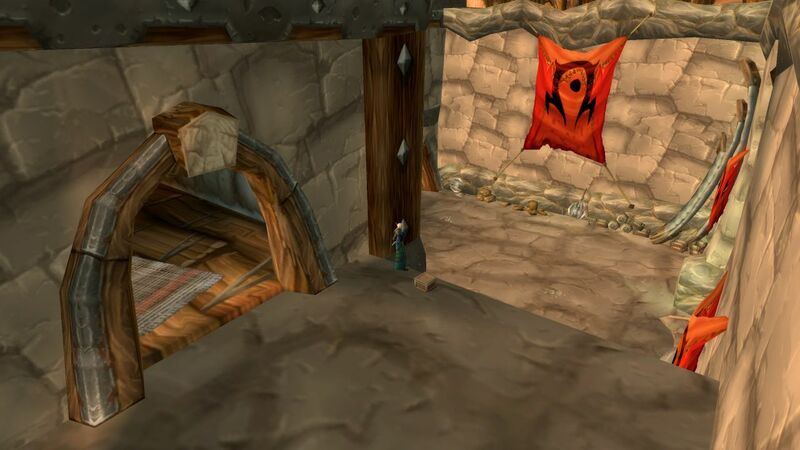 It was Heroic Halls, and even on the first few trash mobs it became immediately obvious that this wasn’t happening. I apologised and left. Dasal’s mana regen wasn’t great, but I felt my problem was actually my healing power wasn’t strong enough. If I didn’t have to use such big heals then my mana regen would be able to cope better. The first answer is more gear, so I expected a lot more normal runs trying to score more JP and even VP. Some debate within the guild and some suggestions from other forums suggested a change to Disc might help. Dasal went away to study this Disc caper. Reviewing a couple of guildies and searching across EJ’s and the blogosphere I came up with a pretty standard build for her talents. Of course, then there’s the fun of figuring out what does what. Where’s my Chakra gone for example. Two Power Words, and this spell that does damage or heals depending on where it lands? The last and probably worst step turned out to be sorting out Healbot and the Naga to have a good setup for actually doing some healing. I ran a couple of BGs to see if I could sort stuff out without making some poor party suffer. Didn’t really help as the other side focused on healers in both runs. Eventually I had a basic setup, and hit the LFD tool. DEADMINES – I wilted somewhat in my seat as my only other runs through here on Dasal have ended in disaster at the forge, and they were normal. Even Mabaho hasn’t really got a smooth run through here and he’s DPS. I did manage to heal all the way through. I must have bit the dirt about 6 or so times, and the party wiped about 3. Not spectacular, but there was no complaints. 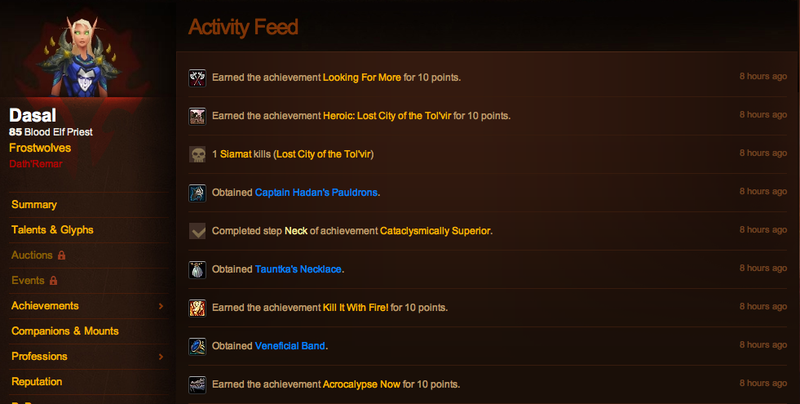 I finished up with the normal and heroic achieve and a couple of extra achieves. I also came away with some ideas on improvements to my control setup. This morning, I didn’t want to sit through a whole run, so again, thought I would head into BGs to muck about. (don’t know why I think I’ll get a chance to sit there and quietly heal in BGs – shrug) In the end 3 runs of WSG got me the last little bit of Honour needed for a piece of Ruthless gear. Second – Previous experience has burned into me that the more gear at expac drop, the easier it is to cross into the new zones and progress. 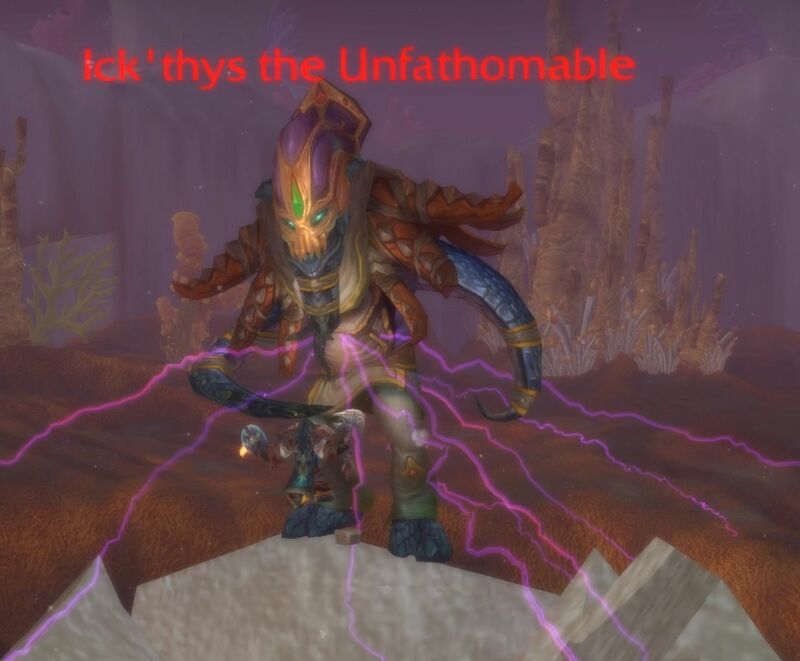 Mab’s T4/5 from BC lasted well into WotLK. And back into heroics, maybe this evening. Our FC is hiding in the alcove, I'm playing pocket heals to him until our flag gets returned. At least that was the idea. I got picked off first here. Author MabahoPosted on April 14, 2012 Categories WoW1 Comment on Heroics let’s go! Well back during the Love event (I forget the name) I had the whole series discussing dresses (and I certainly never expected to be discussing that related to gaming!!!) and the tragic tale of miss 4 destroying Pink Princess (her nickname for Mabango, my lock) Pink dress, from Noblegarden. 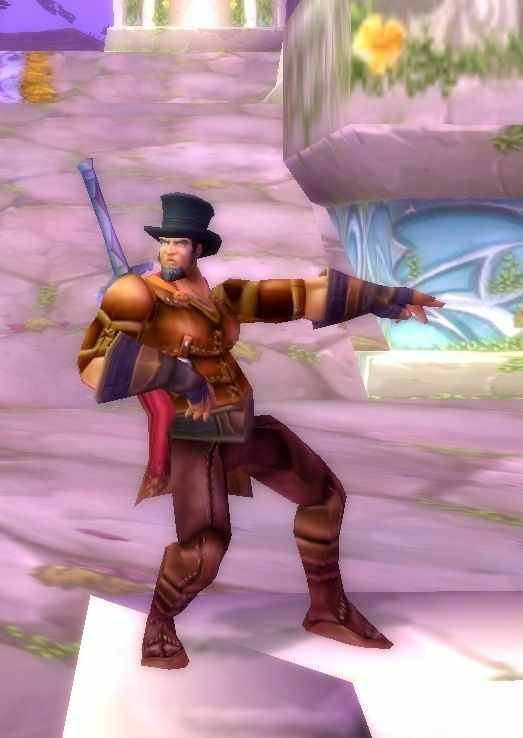 Well it’s Noblegarden again and with us all out there getting heartily sick of looking for Colourful Eggs, but pushing through for mounts and achievements, I’m hard at work looking for a dress. And tonight, she’s keen as to get underway again.